WASHINGTON, D.C.—Late in the afternoon on Inauguration Day, I made my way out of a dicey protest on K street towards the National Press Club, passing rows of broken windows and throngs of smiling Trump fans in red hats. Rep. Barbara Lee (D-Calif.) was one of the first members of Congress to announce a boycott of Donald Trump’s inauguration, so she was spending the day apart from the fray, participating in a panel at Watch Us Run, an event hosted by HuffPost and Bustle. 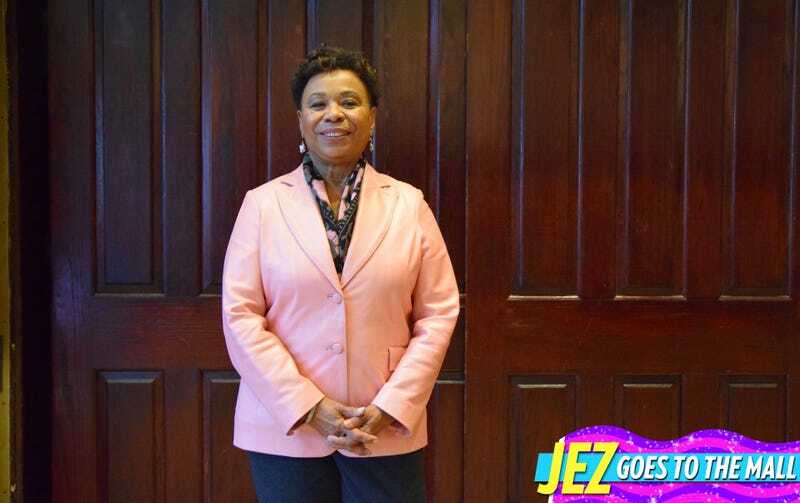 Rep. Lee, a member of the Congressional Black Caucus who represents the 13th district of California, was born in segregated El Paso, Texas, and attended college while raising two sons as a single mother on public assistance. She was the only member of Congress to vote against the Authorization for the Use of Military Force after the September 11th attacks, believing it was “a blank check to the president to attack anyone involved in the Sept. 11 events—anywhere, in any country, without regard to our nation’s long-term foreign policy.” She received death threats at the time, though she’d soon be proven disastrously correct. “The American people will never forget that when a foreign government violated our democracy, Donald Trump chose the interests of another nation over our own,” Rep. Lee wrote in a press release explaining her decision to boycott Trump’s inauguration. In your statement on your decision to skip the inauguration, you said you were going to be “organizing and preparing for resistance.” What does that mean for you? Well, being here, [at] Watch Us Run, it’s the beginning. I think it’s important to work with people, organizations, and women especially, to make sure that we protect the gains that we’ve made and not allow a woman’s right to choose, a woman’s right to privacy be eroded by this administration. But also work to get bills passed, like my bill, the Each Woman Act, which would repeal the Hyde Amendment. And if legislation comes down the pipe to build a wall, we have to come up with strategies to try to stop. Right now, immediately, it’s trying to stop the repeal of the Affordable Care Act, because that’s men, women, people in Republican districts that are gonna get hurt. 30 million people are gonna get hurt. There are going to be a lot of battles we’re going to have to fight, so we have to plan this out, how we’re going to resist, and if there are areas we can work with the new president, we do that. How do you effectively oppose an administration that doesn’t seem to hold rules and traditions, or even the Constitution, in particularly high regard? Has your strategy evolved to meet this challenge? Well, I don’t know if we know the answer to that, but I do know that we need to think outside the box and be very creative. When this president did not release his income tax returns, I mean, for a while people got a little uptight and upset, but after that it was quiet. Now, the nominees that he’s presented for cabinet positions, half of them haven’t even filled out their ethics requirements or financial disclosure statements. You don’t hear a lot of noise about that. People have to hold this administration’s feet to the fire, keep raising these issues and keep opposing, for instance, Senator Jeff Sessions, [who has a] history of opposing equal justice under the law. We have to really recognize that we’ve never seen this before. It’s an extraordinary time, it’s an unusual time, and we have to be out-of-the-box thinkers and not do business the same way we’ve done it before. You famously defied your own party in 2001 when you were the only member of Congress to oppose AUMF. Do you believe Democratic leaders in the Senate and the House are up for the task of opposing Trump? Do you believe that there’s an effective strategy in place? I think they’re up to the task. I mean, you’ve just witnessed some of the actions already, through Leader Pelosi’s leadership and Senator Schumer’s leadership. Number one, we’re trying to keep the Affordable Care Act from being repealed. And I think right now people are going to wake up and see that it’s going to be Republicans also who are going to be hurt, they’re in that 30 million. So I think our leadership is really on the right track and the Democrats are going to be very strong in their resistance to some of these policies. When things come to us that are bad, I think our leadership is up to the task. Having said that, if there are bills that make sense to create jobs, if it’s a good bill that would create good-paying jobs, we want to work together to try to make sure people have the economic security that they deserve. Even if that might mean giving Trump a successful year, by helping him put forward something that would be popular? It’s not about doing anything that makes Trump successful or not, it’s about what’s going to help people. How are we going to protect the most vulnerable? The safety net? Health care? How do we create jobs? We have to work to figure out ways to create more jobs, to try to prevent any action that would turn us back on climate change—we have to not see it in terms of helping the president or not, or what Democrats are going to do as a strategy overall. I think it’s important to resist what’s going to hurt people, and to work to help and protect people from cuts. You were born in a segregated city. How do you feel today, as Donald Trump gets sworn in as president, succeeding Barack Obama? How do you feel about people like Jeff Sessions and Steve Bannon taking power—how has that impacted you? It’s not a good feeling, because I know these people stand for turning the clock back. I remember the days of the poll tax, and I know now that we can’t even get a Voting Rights Act passed. I’ve seen this budget, and I was on public assistance; the safety net could be cut even more. So that’s not a good feeling, but what encourages me is the outpouring of clarity on what’s taking place in the country—the marches, young people who really believe that they still can fight for the American dream. As an African-American, as a woman, you know, we’ve been through so much! Slavery, the Middle Passage, Jim Crow, segregation. We’ve been through a lot. So when Trump says, “What do you have to lose?” Well, we have a lot to lose! Because I remember those days very clearly, and I don’t want to go back. So for me, the fear of going back is real. But I know that there are so many people who came before me who fought just for me to be here today, and I can’t just give up. Have you gotten a big response on your decision to skip the inauguration? Positives, negatives? Both, both. But I think overwhelmingly positive, but, you know..I’ve been reading Twitter! It’s been mostly positive, my district understands. Have you skipped an inauguration before? In 2001, I was part of a protest against the electoral college when the Supreme Court appointed George Bush as president. I did not attend, because the Supreme Court determined that election, and that to me was un-democratic and it shouldn’t have happened. I was also one of the people who did not want the certification of the electoral college this time, because of Russian hacking and influence. Do you feel hopeful about the state of American democracy right now? I’m going to always be hopeful, but it’s going to be up to us to solidify the gains that we’ve made—first of all, in terms of people who have been shut out, marginalized people, but also to protect the democratic processes that we have. Once Russian influence was determined in this last election, I think we need to really recognize that we have a lot of work to do to protect this democracy. And I think people are up for it, I really do.